6. Quiet Time. The lovely Katie calls it her Holy Time, and I'm thinking of adopting the title. This year has brought one of the richest seasons with Jesus that I have ever known. Moving across the country where you don't know a soul is ample opportunity and reason to find dependence on something other than the community and safety I'd grown to love. I still have so much I want to learn, and so much more depth to search out. Thankfully His mercies are new every morning and his wisdom abounds. You can never know or trust enough. 7. Lifegroup. Thanks to Lifegroup Wednesday is probably my favorite day of the week. I have been in a Lifegroup for four years now, and it was the first thing I looked for after moving to Seattle. The church I attended in Waco started Mosaic Community Church around 8 years ago. I knew that I needed it immediately surround myself with people similarly passionate about Kingdom values and work. But it was incredibly strange to plug an address into my GPS and walk up to an unfamiliar door asking "Is this Lifegroup?" But in that group of strangers I found a fantastic group of friends. We have a stellar potluck dinner each week (these people can COOK!) and discipleship groups during the week. They are so encouraging, and I consider myself quite blessed. 8. Dandylyon Drama. When not at Anthro, I work for a children's theatre company called Dandylyon Drama. We are a small team that goes into elementary schools and puts on musical theatre classes and full productions. During the summer, we run camps for preschoolers through high school age, and my first week with the company I directed Hairspray. Let me tell you, children's theatre is a while new world and has been an eye opening experience! I start directing Alice in Wonderland in two weeks and Peter Pan soon follows. It was a great opportunity to start directing right out of undergrad and such a blessing to already be getting great experience. 9. Dancing. You know what I'm excited about? Swing lessons! I took my first round in November and even attended Seattle's West Coast Swing convention. My parents met dancing and I probably danced before I could walk, so it was a blast to get back into it. I start round two next week and hope to go out more frequently. It felt do good to break out my dancing shoes! 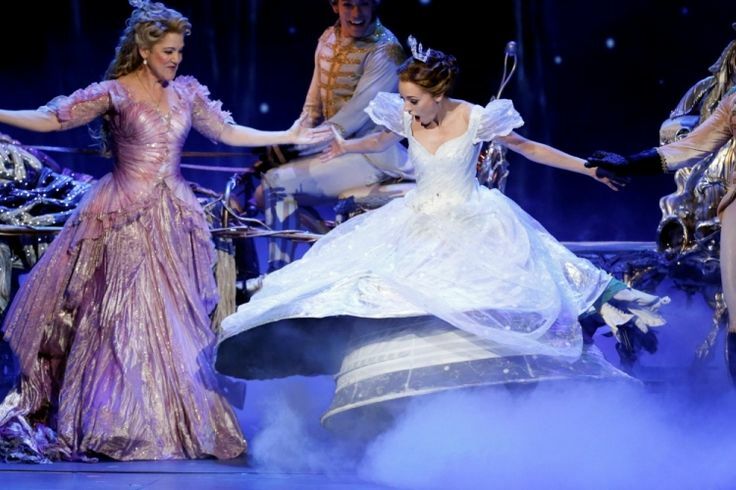 And I must day, after wearing ballroom shoes, I never want to wear character shoes again! Well look at that! 2013 in a nutshell. 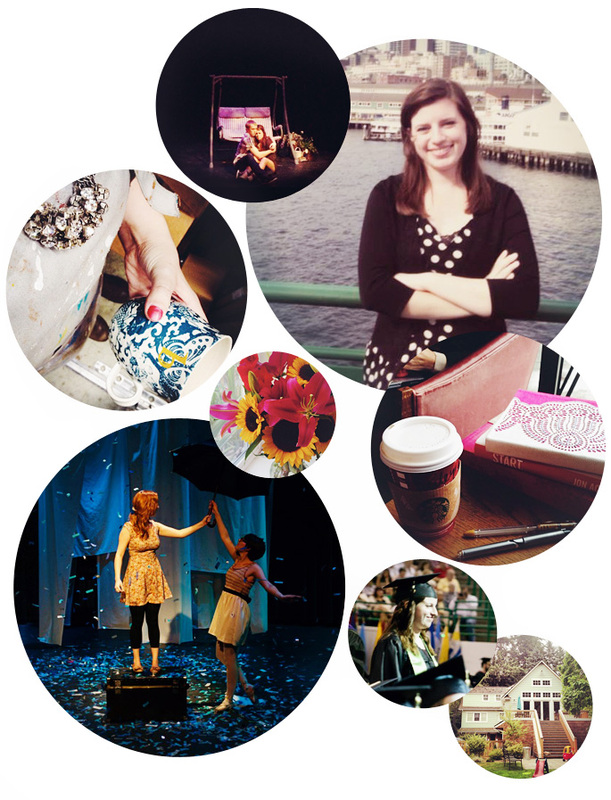 Tomorrow brings a fresh start AND the two year anniversary of this little ol' blog of mine! Happy day! Tonight I'm ringing in the new year with my church group, and I'll see you all next year! It seems to be true that the older you get, the faster the years fly by. After this year, I wholeheartedly believe it. With 2014 just around the corner, I went digging into the archives for some of my favorite photos and scouring journals for some of the major moments, and boy were they hard to choose from! I have been so blessed and gone on so many adventures in the past 12 months, which only builds my anticipation for what's next. God has been good to this girl and His faithfulness remains the same today and tomorrow. Hallelujah and amen to that! 1. Advanced Directing. I'm almost positive that when I first arrived at Baylor and joined the theatre department, I decided that I wanted to be an Advanced Director during my senior year. Four students are chosen to direct/produce/cast/build/you-name-it four "productions" over the course of a year. Spring of 2013 brought two of my favorites, the Post Modern Experiment and my capstone, The Stonewater Rapture. I had the joy of working with dear friends and new friends, collaborating with great designers and stage managers, as well as learn SO much about myself, my directing style, and my heart for the exploration of faith in the arts. I miss being an Advanced Director more than you could know, but I am so thankful for the opportunity to spend my last year at Baylor so deeply invested in making meaningful theatre. It showed me that my passion for learning, directing, and working with students is absolutely God-given and the path I plan to follow in pursuit of grad school and future work. 2. Seattle. Oh me, oh my! This dropped onto my plate straight from Heaven. How do I know this? Because I never would have chosen it for myself. Oh, let me just pick up and move 2,200+ miles away to a city where I don't know anyone just for kicks. Definitely not. In March, I was at the end of a year-long prayer journey, seeking wisdom for what post-grad was to hold. 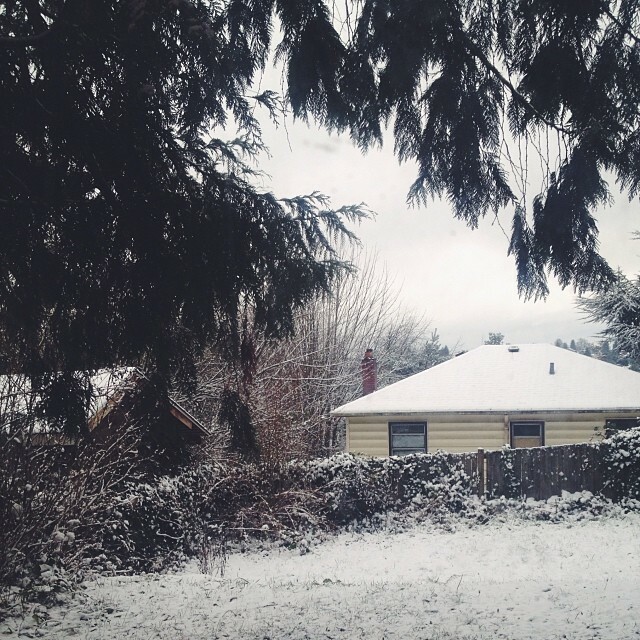 In March, I began looking at summer internships in Seattle, and in March I felt with absolute certainty that Seattle was more than a summer gig. Had you told me I would pack up my bug and move there four months after my visit, I would have laughed and laughed and laughed. You know, I still laugh, but I laugh as Sarah laughed. She was given a big promise, one she dared not hope for or believe, and when it came true all she could do was laugh and give glory to the Lord. That's where I'm at. I laugh that I ever doubted His plan for me or that His adventure would be one I could know and follow on my own. I laugh and say "Thank you!" and "Remain with me, Lord!" every step of the way. He opened every door, from working at Anthro to living with/nannying for the sweetest family, and finding sweet and meaningful friendships at Mosaic Community Church, and I never should have doubted that His goodness would go before me and follow me across the country. 3. Graduating from Baylor University. What. Is. This. Madness. I have a college degree. When did that happen?! Oh yeah, it happened on May 18th. I could not have asked for a better college experience and I will be a Baylor Bear for the rest of my life. Between unforgettable memories, friendships that will last a life time, and the joy of spending most of my days submerged in an incredible art field with people of a similar passion, nothing comes close to topping this time in my life. I miss college dearly, but I am so thankful to say that I left more prepared than I thought for the next season, and closer to Christ than I could have imagined. 4. Blogging. How can blogging be a highlight? Oh my, I'm so glad you asked ;) I have had this blog for almost 2 years (this bloggity's birthday is January 1st!) and this year the community here has come alive in more ways than one! I have had the pleasure of meeting several gals I wouldn't otherwise know and hope to meet more (and see these friends again!) in the years to come. It has been an eye-opening battle to prioritize and plan and to find a vision for my message and life in general. I have been so encouraged in a time where discouragement threatened to reign, and I cannot express the joy this little corner of the internet brings me. Thank you for sticking with me on this journey and being such a blessing in my life! Stay tuned for Part II! In the meanwhile, I plan to spend the next few days soaking up as much home-time, family-time, and friend-time as possible. Merry late Christmas, and a Happy early New Year! Home for the holidays has never meant so much or felt so sweet! After moving across the country in August, I've been counting down the days until I was home again for this sweet season. I never realized how much I'd miss the simple things. Watching my brother play Xbox, shopping with my sister, cooking with Mom, and watching movies with Dad (Pride & Prejudice to be exact, it's our favorite!). Tonight is Nanny and Pop's annual Christmas Eve dinner and I'm eager to celebrate with them. This tradition has changed over the years and now it is just the seven of us. It will, of course, be followed with watching Arthur Christmas and wrapping any last minute presents, then off to bed for sweet dreams of Santa. For now, I'm off! I love you all dearly and so thankful for your place in my life! Have the Merriest of Christmases! To be honest, I haven't had much experience with hand made ornaments. I don't remember making them as a child --though I'm sure in kindergarden I made a popsicle stick frame or something of that nature-- and Mom and I admitted perfectionists and they wouldn't work with our color scheme (which, by the way, is burgundy and gold). But salt dough ornaments have been floating around Pinterest for quite some time and it looked fun, so I thought why not give it a try! Add water and mix until it is moist throughout. 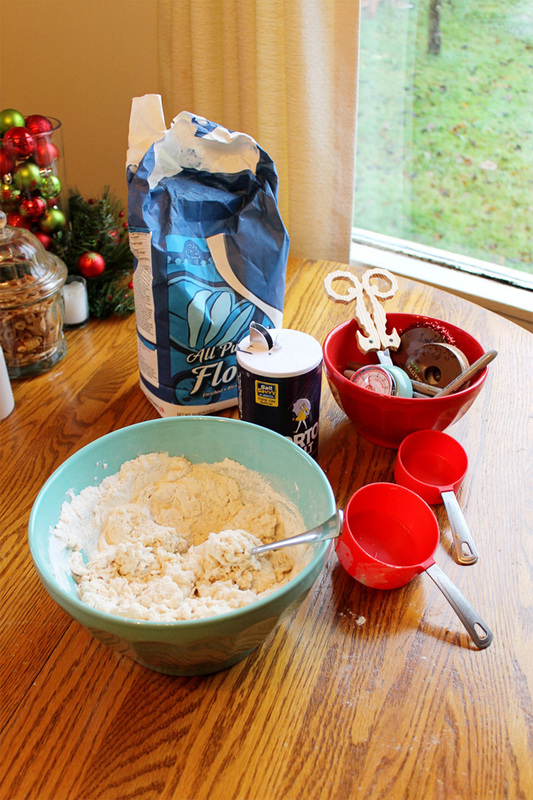 If it feels sticky, add more flour. Knead/roll out on a floured surface and roll into an even layer. Use a straw/pen/toothpick to poke holes for the ribbon. 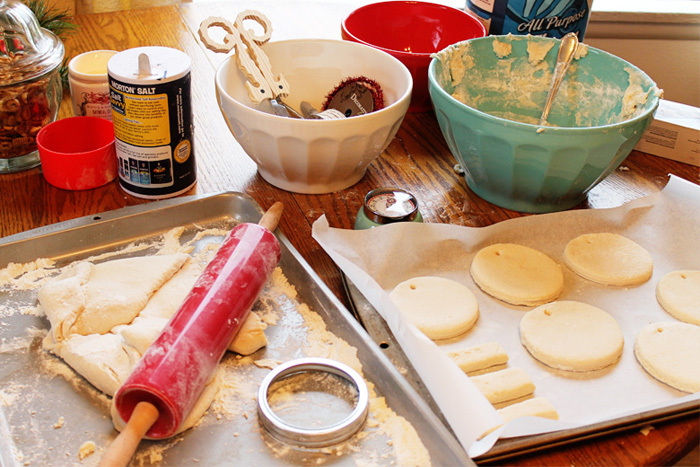 Bake at a low temperature (200-300 degrees) for an hour or until the ornaments harden. *I used the rim of a mason jar because I wanted large, round ornaments. *I also used a matchbox-size container to shape the rectangles for tags. 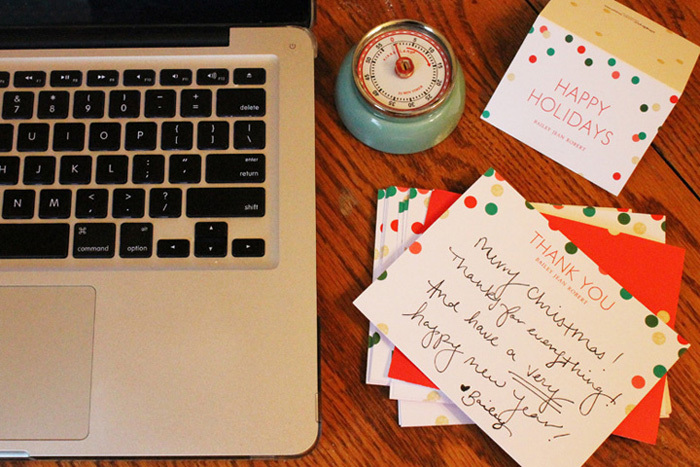 While the ornaments bake or cool, use that time to write a quick note to whoever you're sending the ornaments to --or if you're like me and keeping several, browse Pinterest for decorating ideas ;). I absolutely LOVE these matching gift cards and thank you cards by Tiny Prints. They are from the Sequin Soiree collection, a simple but sassy holiday confetti theme. You can also find address labels, party invitations, and gift tags in that design. Many thanks to Tiny Prints for sending these my way! Anywho. As you are reading this, I am either on a plane headed to the Lone Star State or back at home with my family! Can I get an amen?! Happy Sunday, y'all! And happy 3 days until Christmas! BREAKING NEWS: It snowed last night! If anything was worthy of a midday update, this is it! Today is my first day off from Anthro this week and I had great plans of sleeping in. However, my body clock is used to early mornings and I awoke at 8am anyway. A lovely app of mine sends me the weather at 8am on the dot, so with one glance at my phone I flew out of bed and to the window (well, the back door) and everything was blanketed in SNOW! Needless to say, this Texas girl was pretty elated and enchanted at the sight. 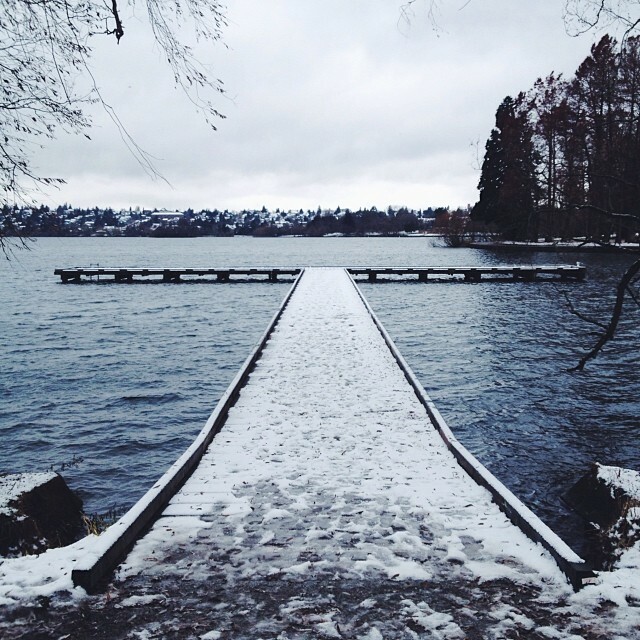 My only plans for the day were grabbing coffee hot chocolate with a friend and walking around Green Lake, and I had the bright idea to walk to the Starbucks near the lake to get some work done. Let me tell you, walking 7 blocks through the snow is a great way to learn that your cheap Payless boots from 3 years ago are in need of an update. My socks are soaked and my toes are frozen. Oh well. While I wait for our coffee date, I've got grad school apps to finish and happy Christmas music to listen to. What are you up to on this lovely Friday afternoon? PS. I go home the day after tomorrow! Woohoo! It's baaaaaaack! This summer I started a mini series called "Three Things on Thursday." It's short, sweet, and something I can keep up with. Plus it gives me a weekly excuse to share some of my favorite finds with you all :) This week sums up my winter-heart in a nutshell. 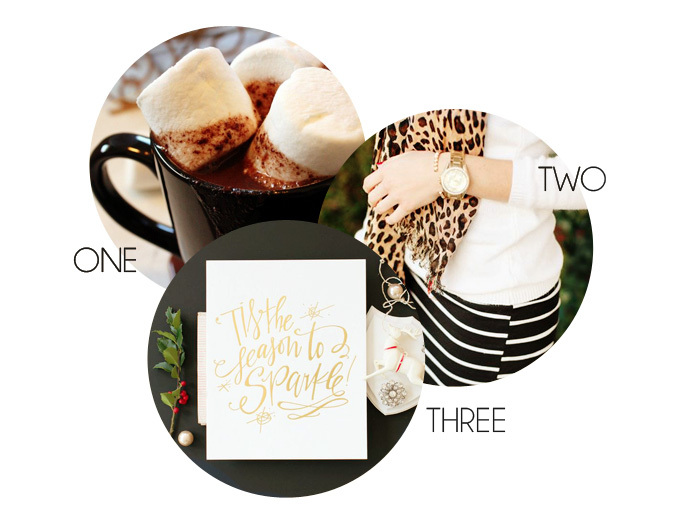 Hot chocolate, scarves and stripes, and a little bit of sparkle. Need a last minute Christmas gift? The prints and products at Lindsay Letters are stunning! I have several and honestly want to collect them all. Hopefully a canvas is in my future ;) As far as the animal print beauty to the right, I'll admit I only own one shirt in such a color scheme and have worn it maybe twice. But the real reason this is included today is the blogger behind it all. 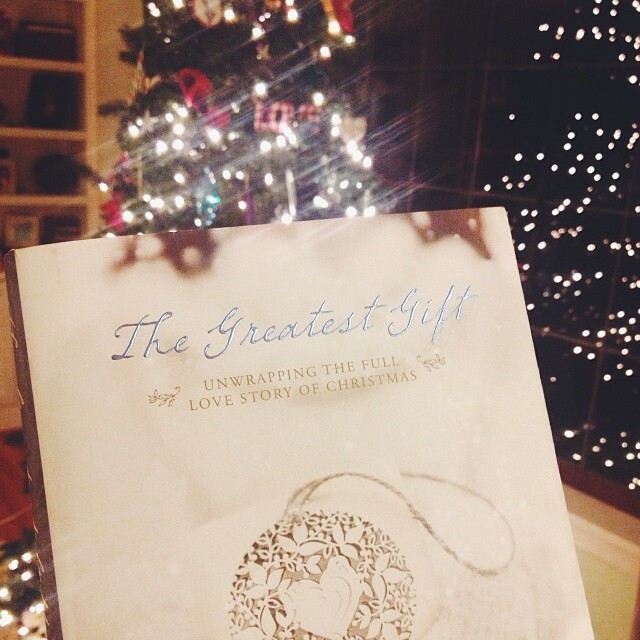 She's got such a sweet heart and great thoughts on the Christmas season. Definitely check her out! Lastly, I am a hot chocolate girl through and through. Even in the summer. I've tried a few recipes this year and this one is next on my list. Nothing like good conversation and a cuppa chocolate to keep you warm. December is my favorite month of the year, hands down. There is magic in the air, grace in our hearts, and warmth in our homes. 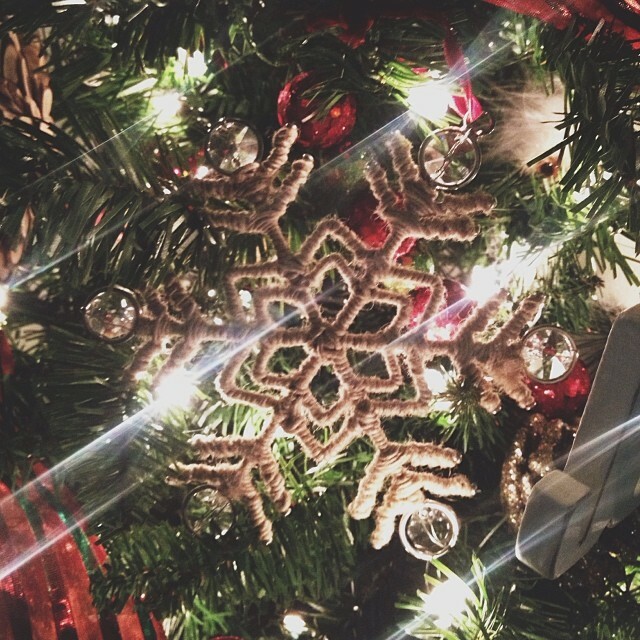 Christmas is a day --a SEASON-- I look forward to for most of the year and this year has been one for the books. I have spent the past 6 months living in Seattle and the words home for the holidays have never sounded so sweet or meant so much. This year was my first time not to decorate with my mom and not to be cramming for finals over the last week. This year was also my first year working retail during the holidays (sort of...) and boy has it taught me a lesson. That lesson? I needed to delight in December more than I thought. With the hustle and bustle of the holidays, there is so much pressure from goodness knows where to get things done, take on the crowds at the mall, and have a Pinterest-perfect living room, holiday party, and pile of presents under the tree. This season, those things have not happened for me. And I'm 100% okay with that! 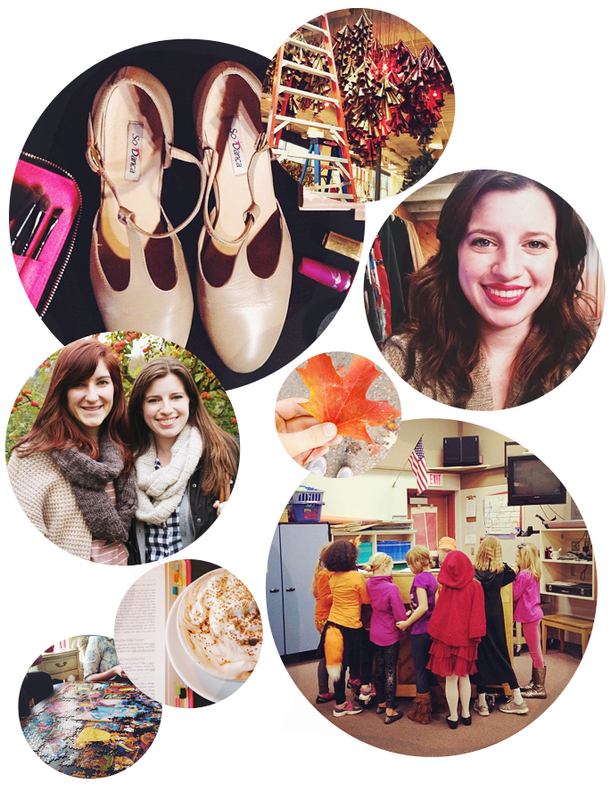 When it came to #delightinDecember, my goal was to find one thing a day that made me smile and share it on Instagram. It did not have to be particularly unusual, more so part of the everyday that I could choose to truly celebrate. 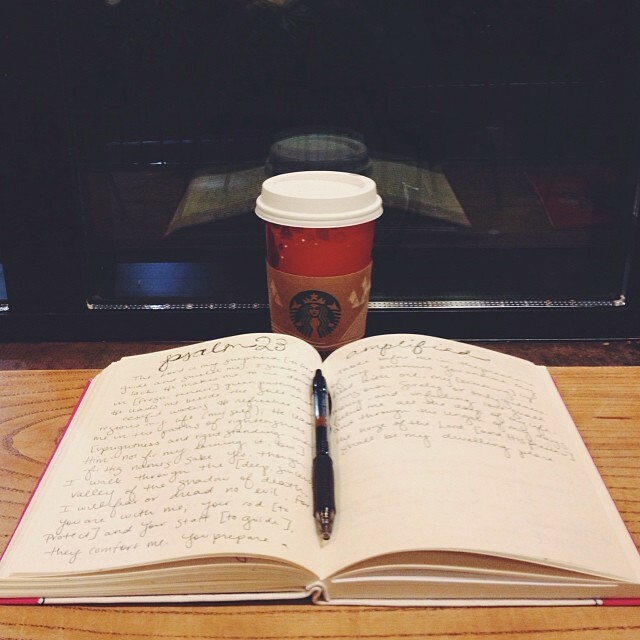 Starbucks, for instance, means a quiet moment on a dark morning with my journal and Jesus. True, I over sleep and don't always make it, but when I do things get off to a great start. Those mornings are a delight. 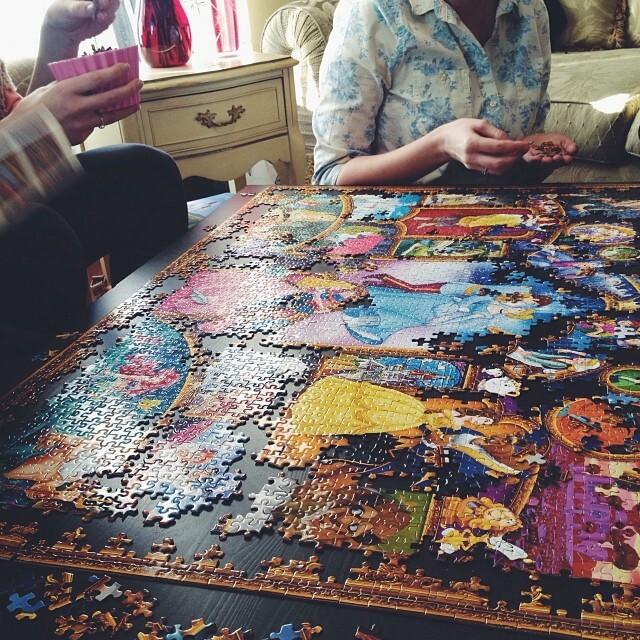 Random conversations with my roommates at midnight --even though 6am always comes terribly early the next day-- and spending hours on Disney princess puzzles are simple joys. Encouraging phone calls or text, even snail mail, brightens my day and is part of the routine and I love it! I may not have a jam-packed holiday schedule, but counting my blessings reminds me that there is plenty to delight in today. 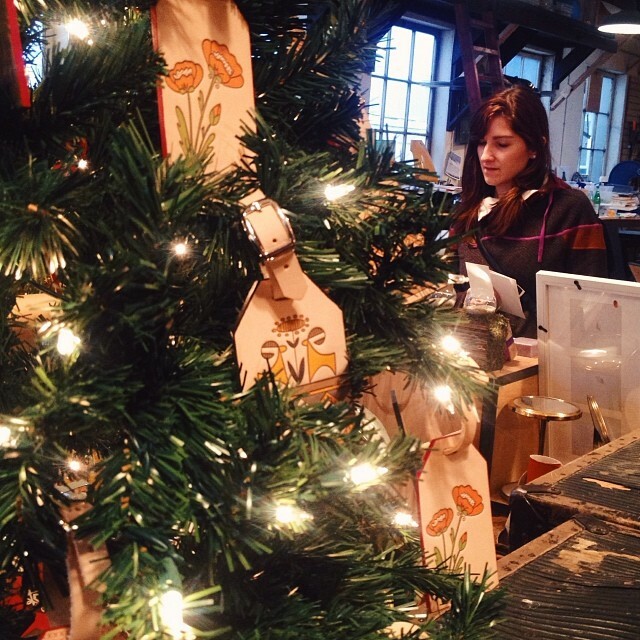 This week, I'm trying to delight in December by being diligent at work and home. Grad school applications, reading and working on Alice in Wonderland, and having a positive attitude at Anthro are not only good for me but ripple out to others, too. Instead of complaining, why not smile? Instead of procrastinating, why not be timely and enjoy an early evening in bed when all is finished? So that's my plan. I'm counting down the days until I go home (FOUR!) and counting my blessings as we prepare for Christmas. Happy Monday, everyone! Well... happy late Monday night evening. Better late than never, yes? On this happy Monday I hope you are bundled up against the cold (especially you Dallas folks, enjoy the ice and snow for me!) and have had plenty of hot chocolate. Hot chocolate used to be such a treat for me; the first crisp day I'd hurry to the closest one I could find and settle in for a good book. Hot chocolate weather was a rare delight, but now every day is hot chocolate weather and that, my friend, is a dangerous thing. I will now be taking donations in the form of Starbucks gift cards to fuel my addiction and to help me survive the Seattle winter (which I hear lasts until at least April... sheesh!). 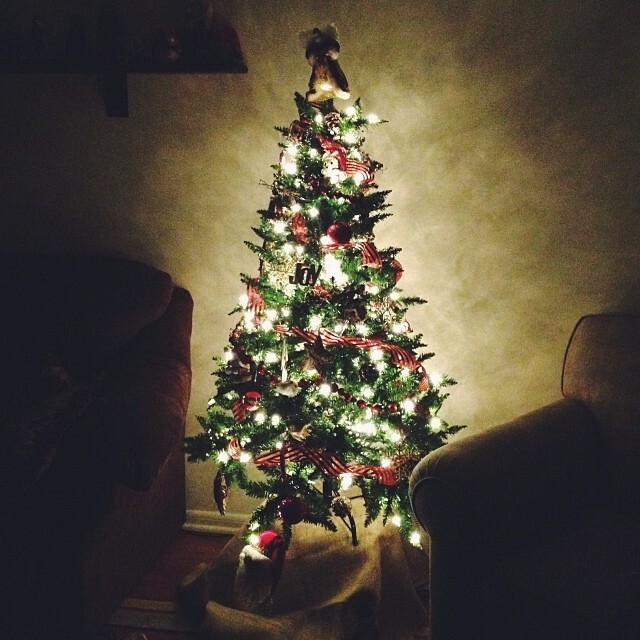 Today is the first day of the #12daysofblogging link up, and I am excited to share with you my love affair with a Christmas tree! Actually, with all Christmas trees in general. I'm a one guy kind of girl but when it comes to trees lit up with sparkling lights and dusted with snow, the more the merrier! Growing up, my most vivid Christmas memories include hauling out box after box after box of tree limbs to put together the 12 footer that stood in our foyer. The limbs were color coded, though some 20 years later the colors have faded and orange looks like brown which somehow looks like blue.. it is quite the adventure to get that puppy standing tall. But once it is up, it sure is pretty! When we moved ten years ago, it made a new home on our front porch. Two years ago the stand broke and it crashed against the dining room wall. But have no fear! A little elbow grease, a long rope, and some sturdy knots had it standing for another season. I don't think we have it any more, but I someday hope to duplicate it. As for my Seattle home, my housemate Kristina brought her tree and we decked it in red ribbon and woodland creatures. I spent the 2012 holiday season working at Pier 1 then snagged SO many ornaments and goodies the day after Christmas when they were 50% off. Add my 25% discount on top of that and they were practically going for a penny! Well, a handful of pennies but you get the idea. This year I've done my best not to purchase any decorations. The Christmas section of Hobby Lobby draws me like a magnet and has always been a retreat for me during finals. But I kept away and haven't purchased a thing this go-around. One of the perks of working at Anthropologie is being constantly inspired by the decor and the display coordinator's concepts. Kirsten is positively brilliant, I tell you! And since I work in the stock room, I always end up dumpster diving in the art room. Now they know to keep the good stuff out for me and have even begun to label a box with my name on it in the break room. I feel spoiled! So far I've gone off with gigantic cardboard baubles to hang (be on the look out for these soon! ), cotton stems and multi colored yarn, and oodles of corrugated cardboard. You may or may not remember a tweet about how I was hunting it down in bulk? Free is always the name of the game and boy do we go through cardboard at work. Again, be prepared for a DIY coming soon to a blog near you. Someday, I hope to have a real tree. My Seattle friends all talk of going into the mountains with their families and chopping down the best in the lot. I might not go that far, but a 10foot, flocked beauty will someday grace my living room. Probably not until I've got a home of my own and have grad school behind me, but hey a girl can dream right? For you night owls, thanks for reading! I'm off to dream of sugar plum fairies and the toy soldiers on stilts that came traipsing through this Starbucks (don't worry, they were safely escorting the snow princesses and Santa's reindeer somewhere in the vicinity...). Have a great night, my dears! I love playing the favorites game. It's a great way to get to know new friends a little bit better, or to remind you about what makes old friends tick. However, when it comes to playing the game I always struggle to remember my Top 5 of... well.. EVERYTHING. And I change them all the time, except for my top 2 which generally stay the same. So for my sanity, and for your entertainment, here are a few of my favorite things. PS. I totally missed the live streaming of Sound of Music last night with Carrie Underwood. Was it any good? PSS. I'm totally not kidding when I say that as I was writing this "My Favorite Things" started playing in Barnes & Noble. IT KNOWS! What categories did I leave out? Are any of these your favorites? Happy Friday, friends! Today, I want to rest in my identity in Jesus. Not who I'm trying to be or who I used to be, but who he says I am now. This song fell into my lap yesterday and it has been on repeat ever since. Turn it on, close your eyes, and let Him speak to you. He delights in you. You are adored. You are desired. He cherishes you. Trust Him when He says so. Believe the things He believes in you. Happy December, everybody! Happy 23 days until Christmas! And most of all --or at least my favorite right now-- happy 20 days UNTIL I GO HOME! Y'all. I don't think you understand how excited I am to be in the great state of Texas for Christmas. December has barely begun and I am counting down the days. But it is my favorite month so I want it to last as long as possible. I hope you all had a safe and splendid Thanksgiving weekend! I worked Black Friday which was a nightmare (no really, I had a nightmare about it afterwards) and the following Saturday, but Sunday brought much needed rest. It also gave me a nice, quiet night at Barnes & Noble to do a little goal-planning for the end of 2013. Also a must-have for this final month. 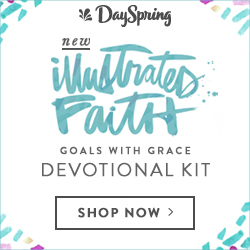 -Follow the She Reads Truth advent study, Emmanuel. -Read/finish Start by Jon Acuff. -Donate/sell unworn clothes from this season. -Block Act I of Alice in Wonderland. 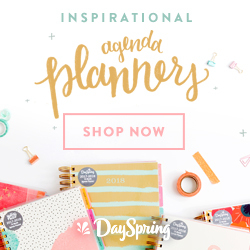 -Organize a planner for the new year. -Send 3 surprises in the mail. -Update Ancored in Love Divine 3x's per week. -Walk the lake more frequently. Along with my goals, I want to share with you another part of my December. I've noticed on Instagram there has been a trend of monthly hashtags (Michaela and Nicole's #joyfilledhomechallenge last month, Lara Casey's #clearOctober, and Lark and Bloom's #ThankYaNov are some of my favorites). I always enjoy reading through these bundles of bloggers and friends as they combine together to celebrate a certain idea or share parts of their life via social media. 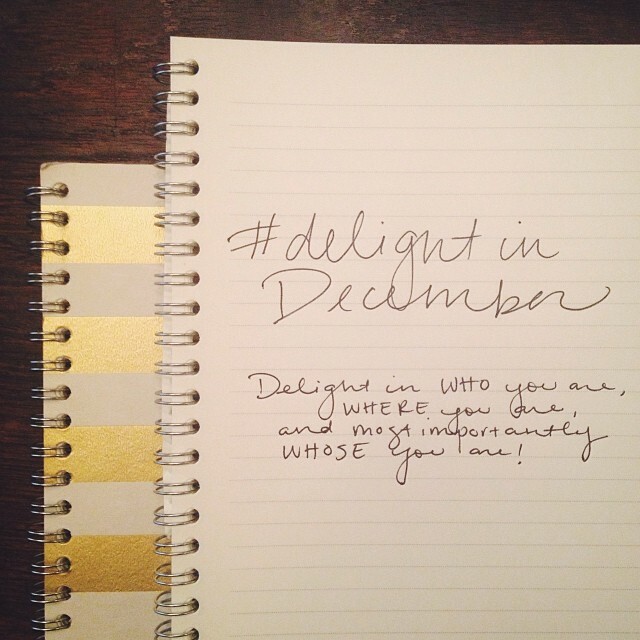 Yesterday I started #delightinDecember, and I cannot wait what this will bring about. Will you join with me? This December, let's focus on the daily delights: what we already have, what happens to us, and who our Savior is and always will be. He is faithful and present TODAY, and while we can get wrapped up in the presents under the tree let's not miss out on the gifts He gives us daily. If you want to take part, just tag your photos #delightinDecember this month :) You'll hear more about my heart on this topic later in the week. Until then, happy December! Enjoy your Monday!